MUMBAI, India—March 30, 2012— Using satellite technology to transmit “first day-first show” movies across India, bringing together an extremely fragmented and unorganized industry of private bus operators to pit stop approach for quick turnaround time of airline to cracking the sporadic mid day meal issue with technology were some of winning entries at the 4th edition of the Innovation for India Awards 2012, organized by Marico Innovation Foundation (MIF). The Awards was graced by Dr Ram Charan as Chief Guest, Mr Nandan Nilekani as keynote speaker. Dr R A Mashelkar, Chairman of Marico Innovation Foundation also spoke on the occasion. The awards were given across Business, Social and Public Service categories, and the most deserving innovations were marked by simplified processes, low costs, sustainability and transformational impact. Indigo Airlines, RedBus Inc. and UFO Moviez were awarded in the business category while Akshay Patra-pioneer in mid-day meal program in India, Fractal Foundation, St. Jude and Teach for India were recognized in the Social Category. 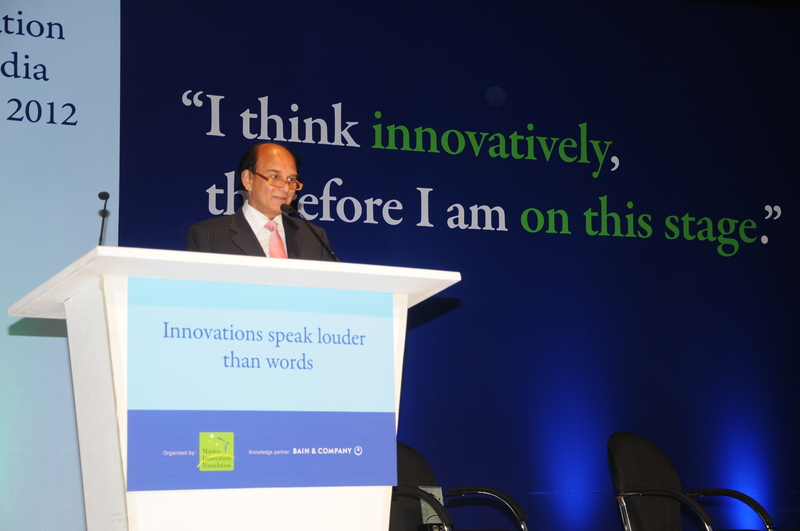 In the Public Service Category, GVK EMRI was the sole entry that the jury felt was unique, impactful and sustainable. 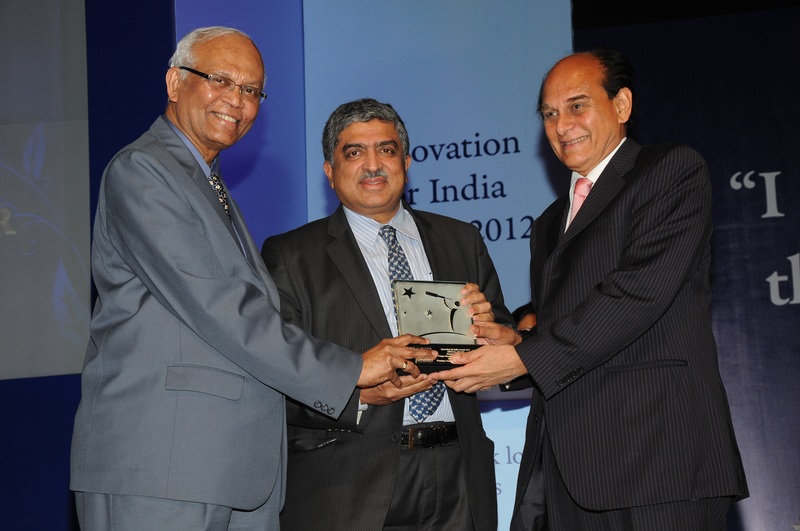 The Innovation for India Awards has a special category- “The Global Game Changer” and this was awarded to the UIDAI project of Government of India for its titanic program to provide biometric cards to millions of Indians. “India is clearly burgeoning with talent so corporate India and government must create an ecosystem to allow innovations to thrive. The Innovation for India Awards by Marico Innovation Foundation acknowledges & encourages ideas that impact the community at large. The awardees stood out among all the 432 entries on basis of sustainability, impact and its inclusive approach” said Mr. Harsh Mariwala, Founder of Marico Innovation Foundation and Chairman and Managing Director, Marico Ltd.
Indigo Airline’s innovations, as part of its low-cost airline model, such as use of ramps for clearance of passengers and its pit-stop approach have enabled it to reduce turnaround time, run more flights and deliver superior customer service efficiently. All these customer-friendly innovations have helped it become the second largest player in the domestic aviation market. Redbus stood out as the pioneer in the online bus ticketing domain, integrating a super-fragmented bus-operator sector and making the booking of bus-tickets convenient and hassle-free for millions of customers. UFO Moviez promises to be a game-changer with its use of satellite technology to transmit movies to millions in theatre complexes – even in Tier-II and Tier-III towns. This not only cuts down print costs, but also fights piracy and increases office collections. In the Social category, Akshay Patra which has a mechanized kitchen with different models for urban and rural schools to enable it to provide hot nourishing food to children was a winner. Other winners in the Social category have also shown strong innovations and powerful impact. For instance, Fractal Foundation has transformed lives of rural artisans and weavers through its focus on micro-spinning which has resulted in a five-fold increase in employment and doubling of artisan salaries. St. Jude, with its free and holistic child care centre, focuses on pre and post cancer treatment for children. This has allowed St. Jude to engage families to create a conducive climate for the affected child to get educated, through proper tracking mechanisms and creative ideas. Teach for India has innovatively sought to bridge the quality gap in education by involving professionals to teach kids in government schools in towns and cities. Visit http://www.maricoinnovationfoundation.org for further information. A significant CSR initiative by Marico – the “Marico Innovation Foundation” was founded in 2003 with an objective to fuel Innovation in India. Under the leadership of stalwarts like Dr. R A Mashelkar, the Foundation focuses on providing the country with a belief that Innovation is a crucial way to leapfrog into the center stage of global business leadership. Over the last five years the Foundation has been playing a catalytic role by disseminating knowledge through cutting edge research on breakthrough Innovations. Its reach is first envisioned to cover the business community, both professional and entrepreneurial. Going forward this reach will expand to future business leaders and the general public. The Marico Innovation Foundation is steered by an eminent governing council that oversees both its vision and direction. While the Council is chaired by Dr R A Mashelkar National Research Professor, NCL, other visionaries like Anu Aga, Director, Thermax, Sam Balsara, Chairman & Managing Director, Madison World, Kishore Biyani, Founder and Group CEO, Future Group, Ashwin Dani, Vice Chairman & Managing Director, Asian Paints, Dr Naushad Forbes, Director, Forbes Marshall Pvt. Ltd, R Gopalakrishnan, Executive Director, Tata Sons, Ranjan Kapur, Country Manager – India, WPP, Prof Prasad Kaipa, Executive Director, ISB, Harsh Mariwala, Chairman & Managing Director, Marico, K V Mariwala, Chairman, HPFL, Prof Sujata Ramdorai, Dorab Sopariwala, Consultant, Ravi Venkatesan, Independent Director, Infosys, form a part of the Council. Mrs Namita Vikas, Principal Consultant to the Foundation leads and manages its agenda. This entry was posted on April 16, 2012, 2:52 AM and is filed under Featured. You can follow any responses to this entry through RSS 2.0. You can leave a response, or trackback from your own site.